Looking for something to spice up your Christmas dinner? Here’s a cool new site which just might help you find that dish that will give that extra oomph to your Christmas meal: Recipe-Finder. You can, of course, simply go to Google and look for a recipe. After all, Google knows everything, right? Then again, what if you do not know exactly what you are looking for? What if you only have certain ingredients in mind? What if you are thinking more about the prep time involved? Or maybe your guests are all health conscious, and you want to limit your dishes to healthy ones. That’s where Recipe-Finder comes into the picture. 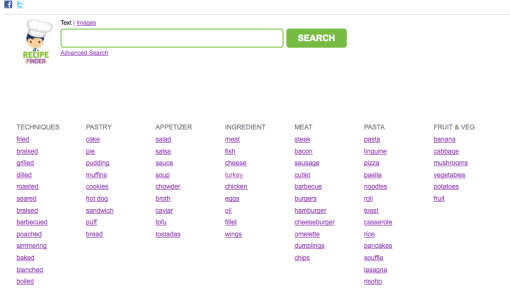 This new recipe search engine makes everything easy for users to find recipes without having a very specific idea in mind. When you visit the homepage, you’ll see the mandatory search box, but more than that, you’ll receive a helping hand from links that can point you in the right direction. See the image below and you’ll know what I mean. If, at the beginning, you don’t know exactly what you are searching for, the categories and the links will give you a start. In addition, the Advanced Search feature makes your search even more customized. As you can see, you can specify the calorie content, the cooking time, and the number of servings. These parameters certainly gives you more relevant results for your search! 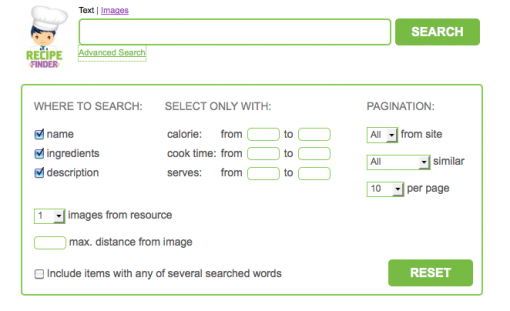 You can also do an image search to check out the most enticing images of dishes. More than simply getting the images, though, if you hover on one, you will see a preview of the recipe, which is clickable and will also give you a quickview version.